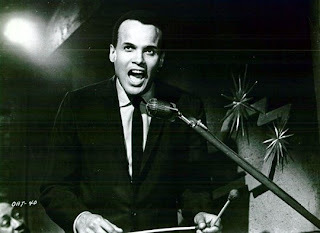 Despite motion picture success in films such as Carmen Jones (1954; which re-teamed him with Dandridge), Belafonte encountered similar hostile racial attitudes in the movie industry — controversy arose from his performance in the 1957 film Island in the Sun, which intimated that there was a romance going on between his character and that of Joan Fontaine’s — something that was anathema to Southern audiences (his publicist, Mike Merrick, observes that the ticklish situation nevertheless made curious onlookers more determined to see the film). 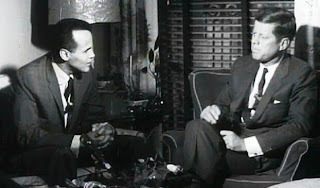 Belafonte’s struggle to find good roles free of negative black stereotypes led him to start his own production company in HarBel — which produced movies such as The World, The Flesh and the Devil (an “end of the world” film whose ending was tampered with by MGM when the touchy issue of a romance between Harry and white Inger Stevens once again caused Southern audiences to revolt) and Odds Against Tomorrow (both 1959). 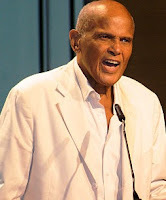 (In an interview with The Daily Beast, Belafonte cited the last movie — a noir that mixes a heist film with a searing examination of racial prejudice — as “the centerpiece of my work in cinema.”) Everywhere Harry seemed to turn he would confront the specter of intolerance; his television specials Tonight with Belafonte and Belafonte, New York 19, despite winning critical and ratings accolades (Tonight won Harry a Emmy for outstanding performance in a variety or musical program or series) earned him enmity from the sponsors for his insistence on using racially integrated casts. 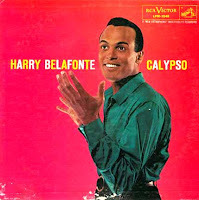 Sing Your Song provides telling details about Belafonte’s humanitarian efforts on behalf of Haiti, South Africa and other nations, particularly as one of the organizers behind USA for Africa and as goodwill ambassador to UNICEF …and comes full circle to the actor-singer’s struggle to make individuals aware of the growing problem with at-risk and incarcerated black/Latino gang youth (his palpable rage at seeing television news footage of a 9-year-old girl being handcuffed because she was “unruly” is not something easily forgotten). If there are any weak areas in Song, it’s that Belafonte’s controversial stance on the Iraq War (with headline-grabbing remarks directed toward its architects U.S. Secretaries of State Colin Powell and Condoleezza Rice, not to mention President George W. Bush) is sort of glossed over, but then much of the material from later in his life (including some of his film work from the '70s up to today) is telescoped to fit the demands of the documentary’s running time. 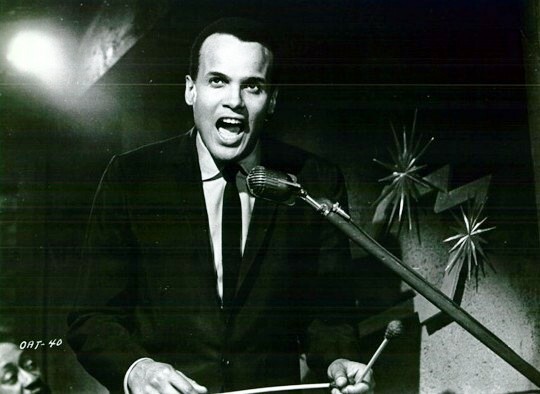 “How could it be that the world is in the chaos and disorder and the consuming violence that we are all experiencing after so many had invested so much to change that fact?” Harry Belafonte asks the interviewer’s camera close to the end of Sing Your Song. The struggle against injustice is a constant one, and while Harry Belafonte was able to temper the fight on occasion through his music and acting, he would pay a price for his activism; several of his children and second wife Julie Robinson (the two of them later divorced and Belafonte married his third wife, Pamela in April 2008) relate in Song that while Harry wasn’t a bad father it was often a trial serving two families (his own and his activism) making demands on his time. The release of this documentary and his memoir My Song comes at a most opportune time when the U.S. is in a current state of upheaval over the issues of unemployment, health care and poverty. 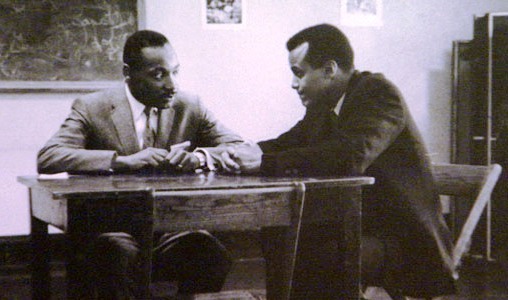 It is one thing to allow individuals to do the heavy lifting addressing the ills of the system in order for you to reap financial benefits (and perhaps run for president), it is another to commit yourself to a mindset that “from the time I go to sleep till the time I get up, I seek out the injustices done to humankind.” Harry Belafonte continues to sing his song…and we are all richer for his having done so. The original HBO documentary Sing Your Song has an encore performance today at 11:30 a.m. EDT (10:30 a.m. Central) and also can be viewed later at 2:30 p.m. on HBO West. It will continue to air at various time and dates on various HBO channels through Nov. 22. The documentary also is available on HBO On Demand (where applicable) until Nov. 13. It will be accessible to HBO subscribers on HBO GO until Dec. 31, 2012. For more details, check out its entry on HBO’s website here. Excellent post, Ivan. Powerfully written and a great tribute. Thanks for the heads-up on the documentary times. Interesting post. I don't have HBO, but will keep an eye out for this doc when it becomes more widely available.